JNation Entertainment will be bringing in yet another boy group for the rookie special in the month of May. A back-to-back line-up with South Korea's rising boy group, it'll be showtime with A-JAX! Formerly known as DSP Boyz, the group officially changed it’s name to A-Jax after confirming it’s 7 members(Hyeongkon, Jaehyung, Hyojun, Yunyoung, Sungmin, Seungjin and Seungyub). 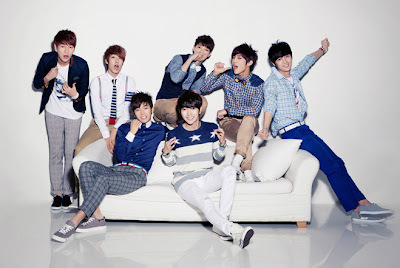 A-Jax made their debut in June 2012 under DSP Media, home to popular idols like KARA, Rainbow and SS501. The group is going full-force on its road to success. A-Jax is reported to be the first group to simultaneously make a debut in Korea and Japan in 2012. Despite being raw in the music industry, A-Jax has been labelled as the successor of their senior label-mate - SS501 (who has since gone on with individual activities). Taking Japan by storm, A-Jax has successfully held promotional events for their first Japanese single album 'One 4 U'. They were also the opening act for label-mate KARA's Japan Concert Tour - 'Karasia'. In less than a year, A-Jax has released 3 Korean singles(plus 2 Japanese versions) and a mini-album '2MYX'. Their efforts were recognized as they received their first award, 'Arirang's Super Rookie Idol 2012'. The group is in preparation for an upcoming album in April 2013. Member Hyeongkon recently tried his hands in acting. Starring in the latest KBS drama 'IRIS 2', Hyeongkon takes on the role of an NSS agent alongside idol-actors like MBLAQ's Lee Joon and BEAST's DooJoon. On the other hand, Hyojun and Seungyub have been picked to be co-emcees for a Japanese channel - KNTV's 'Music Kan'. Just like its name, a deep reference to the Trojan War hero that brought victory to the Greeks, A-Jax is determined to show their strong selves and stay on top of the game. Fans can look forward to an amazing show with A-JAX in Singapore! *Only 300 tickets available for VIP & Cat 1. Ticket can be purchase online at Ticketbrite: www.ajaxsg.eventbrite.sg or Call +65 9775 9169 You can also email to admin@jnationent.com, if you are unable to purchase it online.